I’ll let you in on a secret; absolutely nothing. Ok, maybe except for the taste in some cities, especially if you are a spoilt country girl like myself, with access to ice cold, fantastic tasting water straight from the tap. Now I prefer to put it through a filter before I drink it, because I like the taste better. My boyfriend keeps telling me that is silly, because I need fluoride for healthy teeth, and the filter takes that away. I would be happy to post a picture of my teeth, to let you know they are just fine, I must be getting fluoride from somewhere else. Competition, which one doesn’t fit in? Back to the water. There is plenty of bottled water to be bought. And most of it I am fine with, the plain, no added anything water tasting like water. If you have too much money, I don’t have any problem with you spending it on bottled water. Water, in the end of the day, is good for you. It is when water has to be marketed as Fat Free, Low Calorie, Rich In Vitamins, 98% Sugar Free and No Transfat that you should hear alarm bells ringing in your head (or it could just be me standing behind you in line at the super market with my bell!). There must be something wrong with your water if the guys producing it feel the need to market it as Fat Free. Last time I checked, water IS fat free. And calorie free. And with no sugar what so ever. 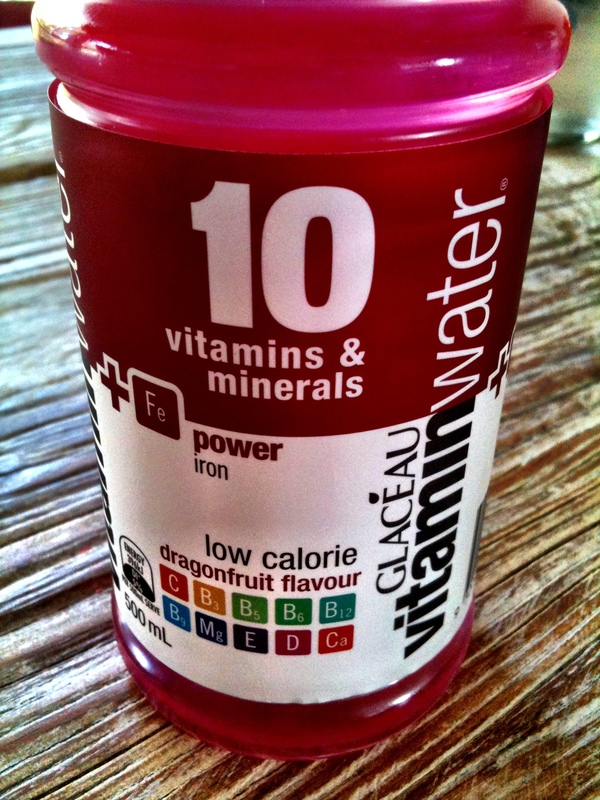 Let me just take one example; Vitamin Water. That sounds awesome doesn’t it? You get vitamins with your water and you don’t need to stress about making dinner and getting those vegetables down. Time saved, water and vitamins all in one! Awesome!! Wrong! Quick look at the label shows me it is 22 grams of sugar in one bottle of 500ml. That is a lot more than the average banana I talked about yesterday and about 5.5 teaspoons of sugar if you calculate with one teaspoon being 4 grams. If you prefer to talk about calories, the bottle has 95 kcal, that is more than a Freddo Frog. And you think you are just having some water with some awesome vitamins. In this ‘water’ you will also find soybean. Soybean? 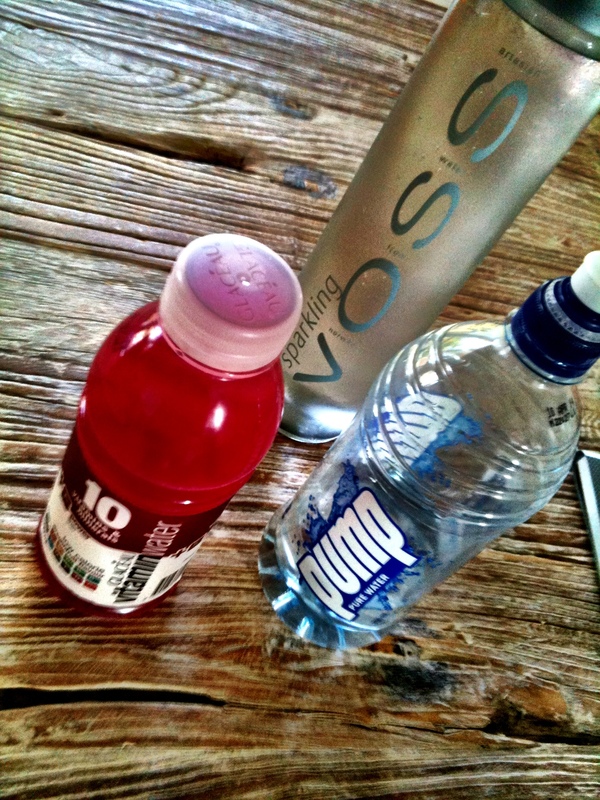 And flavour and colour of course, who likes their water non-coloured? And some food acid. And of course all the added vitamins and minerals; calcium lactate, magnesium chloride, ferric pyrophosphate, Vit C, Niacin, Vit E, Pantothenic Acid, Vit B6, Folate, Vit D and Vit B12. I am sure they just took a syringe and sucked these goodies out of the fruit and vegetables they came from and just added them straight into the water, all natural, no science needed. Because it is just water, right? Mmmmmmm, yum! 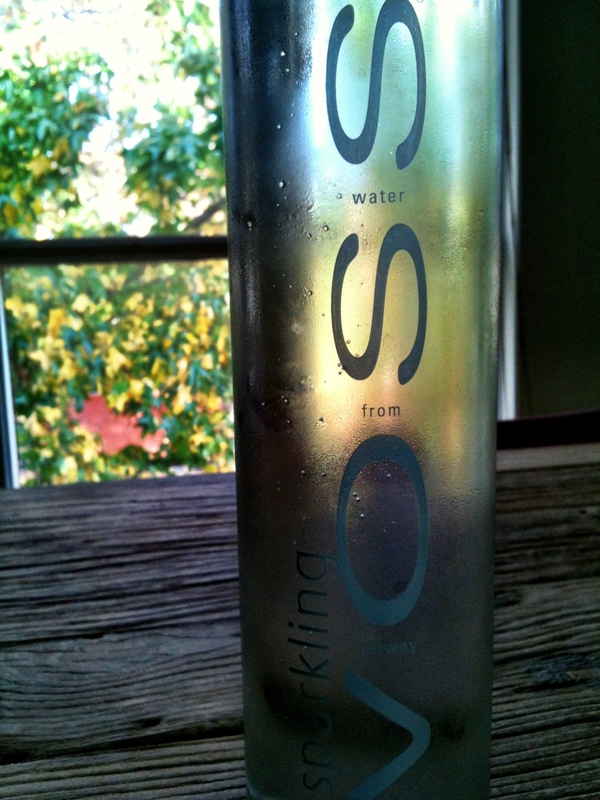 Right now I have a Sparkling Voss Water bottle sitting next to me. But do you know what? It’s filtered tap water in it, I just like the bottle (I bet you have never heard anyone say that sentence before). It is made of glass, I can re-use it so I reduce my massive need of buying bottled water and when I want to get rid of it, I can recycle it. Good for me, good for the environment. And it only contains water, exactly what I want to drink when the bottle says water on it. This entry was posted in Food, Interesting Things About Food (Mostly) and tagged Fat Free, health, healthy-living, Lifestyle, Marketing, Natural, Norway, Water. Bookmark the permalink. 5 Responses to What Is Wrong With Tap Water? Yeah, water isn’t just water anymore! Have some beautiful Norwegian tap water for me today! I miss it so much!